MUMBAI: After singing record breaking songs for blockbuster films like Dangal and Baahubali, the king of pop Daler Mehndi is coming out with another blockbuster song, but this time in Kannada. 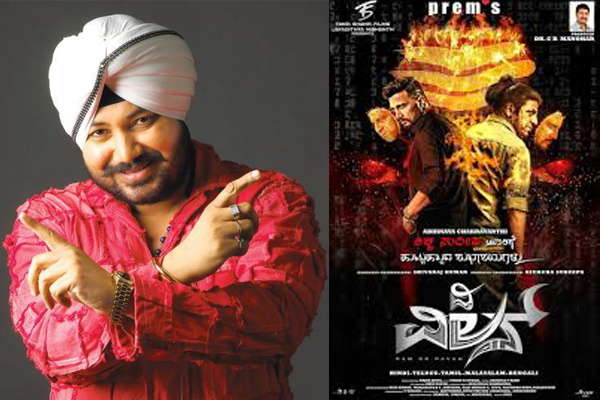 Daler, whose Bahubali song was the highest streamed song on Google play music app for 2017, has now sung for the upcoming Kannada movie, The Villain. Arjun Janya, the music director of the movie recently came to DM Folk Studio to record the song with musical maestro Daler Mehndi. After the recording, Arjun told that he was quite amazed to see Mr Mehndi finishing the recording of the Kannada song in just two hours, despite Kannda not being his mother tongue. Directed by Prem and produced by C. R. Manohar, The Villain has a stellar cast of Shiva Rajkumar, Sudeep, Amy Jackson, Mithun Chakraborty and Srikanth. The film is scheduled to release on 24 August 2018. MUMBAI: One of the finest directors and screen writers in the Indian film industry, S.S. Rajamouli, who has directed films such as Baahubali and Magadheera, recently took time out to watch Disney’s Aladdin- the Broadway style musical produced by BookMyShow in Delhi. MUMBAI: Armaan Mallik who has been riding high on success has got another reason to celebrate. Armaan, recently bagged the Best Playback Singer award at 65th Filmfare Awards South, for the Kannada song, Ondhu Malebillu. MUMBAI: Known for his famous Punjabi songs, the pop bhangra icon of Indian Music Industry, Daler Mehndi, who is also an ardent environmentalist, has an important message. Mumbai: EMI Records India artist Rishi Rich and UK based Indian R & B Singer Veronica Mehta recently won the Best Soundtrack award for the film Boogie Man at the UK Asian Film Festival. The film has been directed by noted filmmaker Andy Morohan.